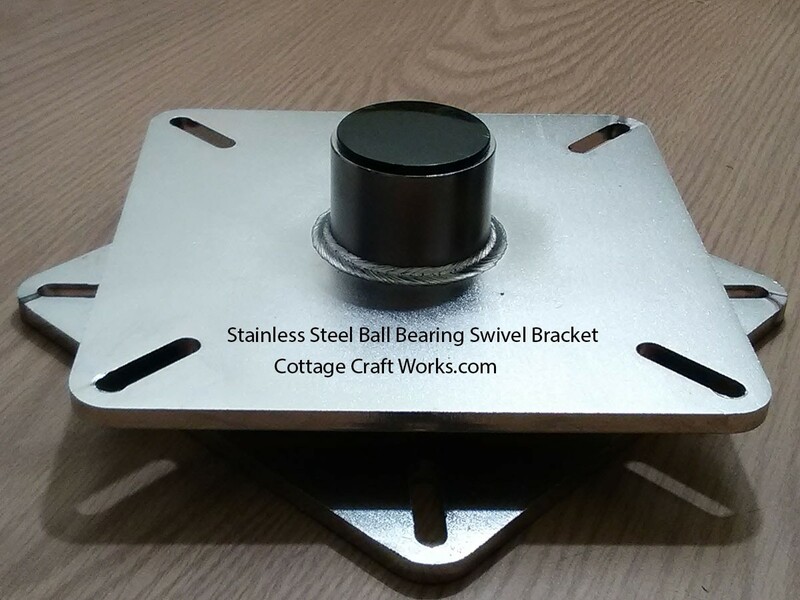 USA heavy duty stainless plate sealed ball bearing smooth turning swivel made for the beach and coastal Amish made Adirondack swivel chairs. Sealed axle style ball bearings resist sand and saltwater spray. 1000 lb. capacity. Use on marine, boats, docks, outdoor furniture, turning displays, wire spool racks and much more. Select from USA ¼” 304 or marine 316 Stainless Steel. Priced as 304 stainless, select 316 stainless using the drop-down box to see the incremental price difference. Compact turn swivel measures only 7” x 7” x 2-1/4” thick with bolt hole spacing at 5-1/2”. Mount horizontal for display racks or vertical for spool racks. 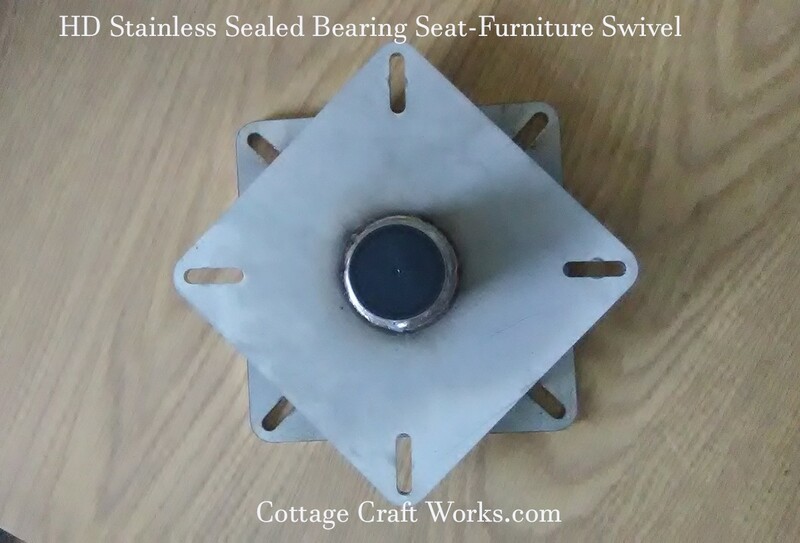 Unlike lazy Susan style swivels that roll on an open ring of ball bearings, these Amish made swivels turn on an axle style sealed bearing pivot. Blowing sand and saltwater spray cannot penetrate the ball bearings and cause them to turn rough or seize. Note: the 1000 lb capacity was determined by direct and side to side weight testing using a standard 18” x 18” chair seat base. 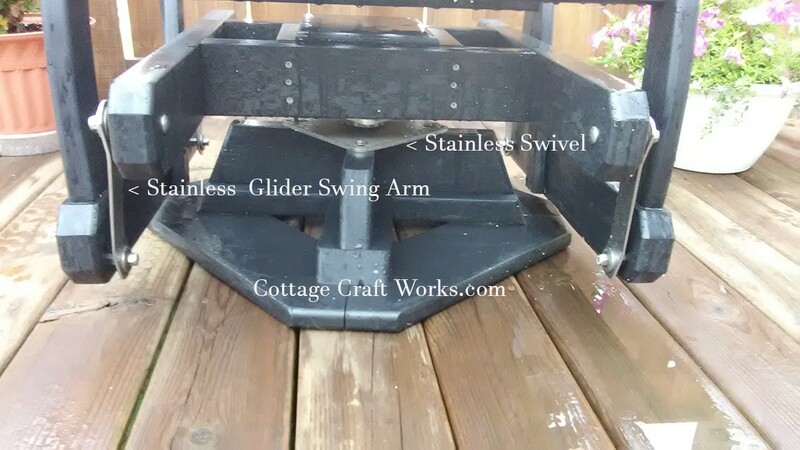 Larger bases will create more leverage to the sides thus, as the base goes out larger from the center pivot the weight capacity will also diminish. We also carry 304 and 316 stainless glider bearing swing arms Click Here for more information.